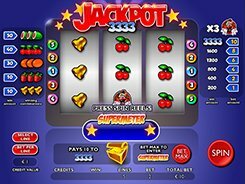 Jackpot 3333 is a non-progressive classic 3-reel slot equipped with 5 paylines. The symbol set incorporates traditional Vegas-style symbols including bells, strawberries, oranges, cherries and watermelons as well as a joker. A coin size comes fixed at $1, and a player may place one or two coins on each line, so the maximum bet is $10 per spin. Pressing the Bet Max button activates the Supermeter mode that gives the chance of winning the 3333-coin jackpot. To hit the grand prize, a player needs to bet maximum coins and get three joker symbols landed on a payline. If betting less than ten coins, a three-joker combination will award 200 to 1600 coins. Besides, you can win a mystery cash prize randomly on any spin you make on Jackpot 3333. Other winning combinations formed by three matching symbols pay out 10 to 50 coins. Overall, the slot is likely to be captivating for classic slot aficionados as it offers an authentic fruit machine experience. PLAY FOR REAL MONEY!